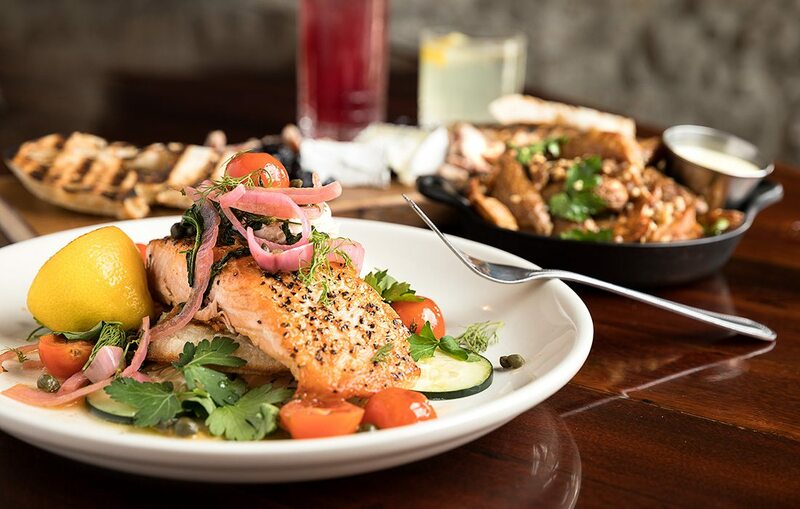 After distancing itself from its past as CB Social House, Social on Patton has reinvented the menu for the changing tastes of Springfield. Like a lot of 417-landers, I succumb to fried food cravings—and when they hit, nothing but CB Social House’s hot chicken and chicken skins would satiate them. 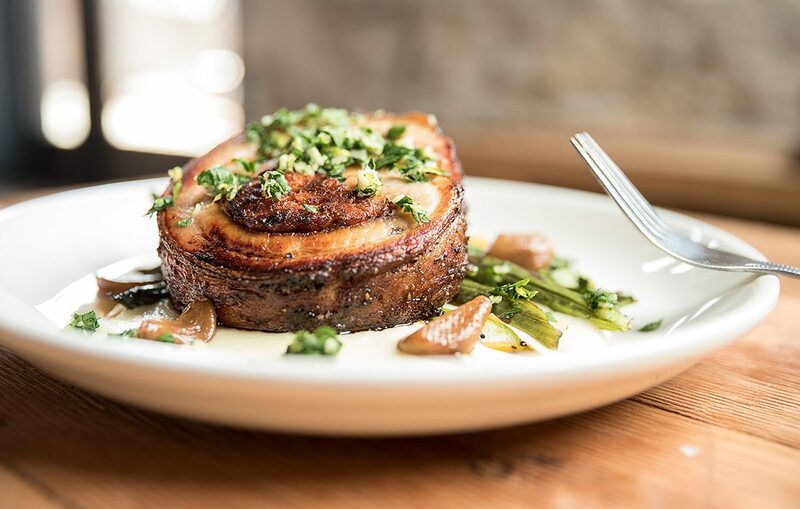 When the restaurant, an offshoot of barbecue spot City Butcher, announced a change of ownership and a rebirth earlier this year, crowds lamented the loss of these fan-favorite hits. 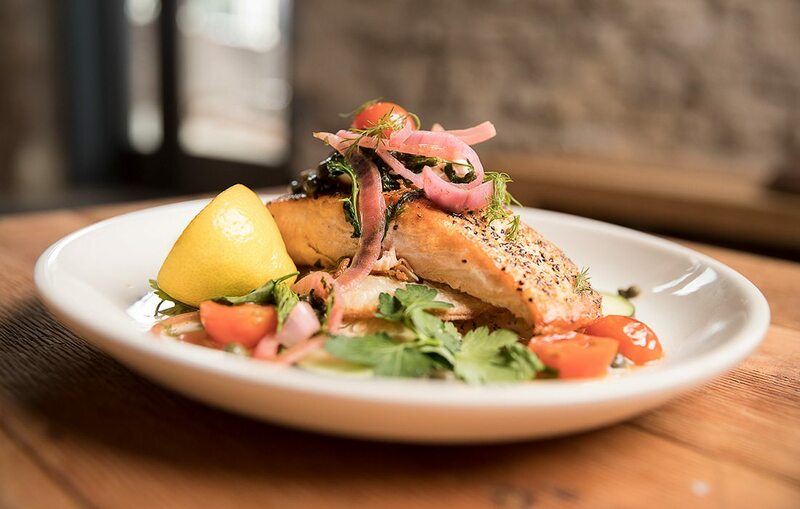 With the new concept, dubbed Social on Patton, the building, interiors and even some of the same staff, notably Executive Chef Daniel Stern and Beverage Impresario Doug Riddle, stayed the same, but the menu departs from the Southern food focus of CB. I waited a few months before testing Social to see if it lived up to CB’s reputation. It exceeded it. In fact, you could stop reading this review right now because that’s all you need to know. 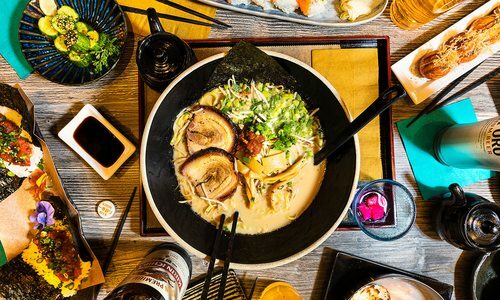 The atmosphere is friendly and familiar—of course; the offerings are inventive; the flavors leave a lasting impression; but, ultimately, eating a meal at Social is, simply put, a lot of fun. 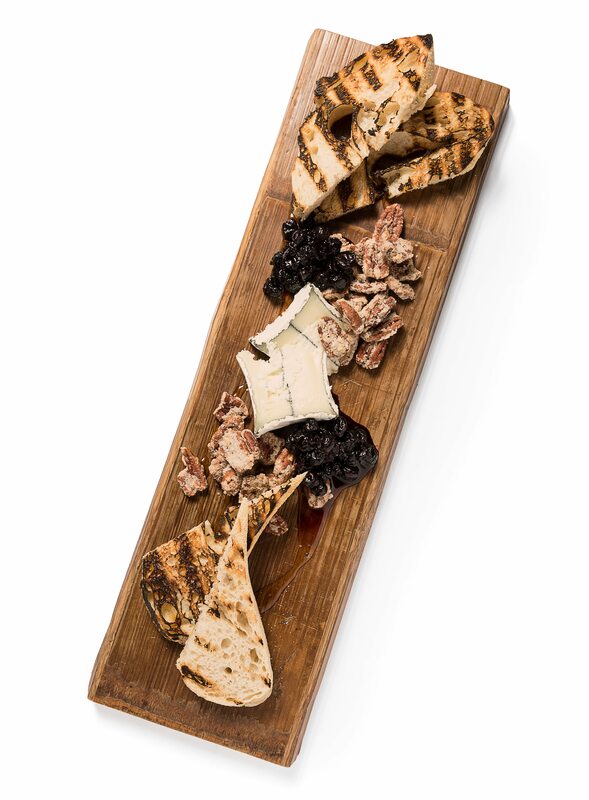 Grilled sourdough, blueberry chutney and honey encircle the cheese board’s centerpiece: Humboldt Fog Goat Cheese. 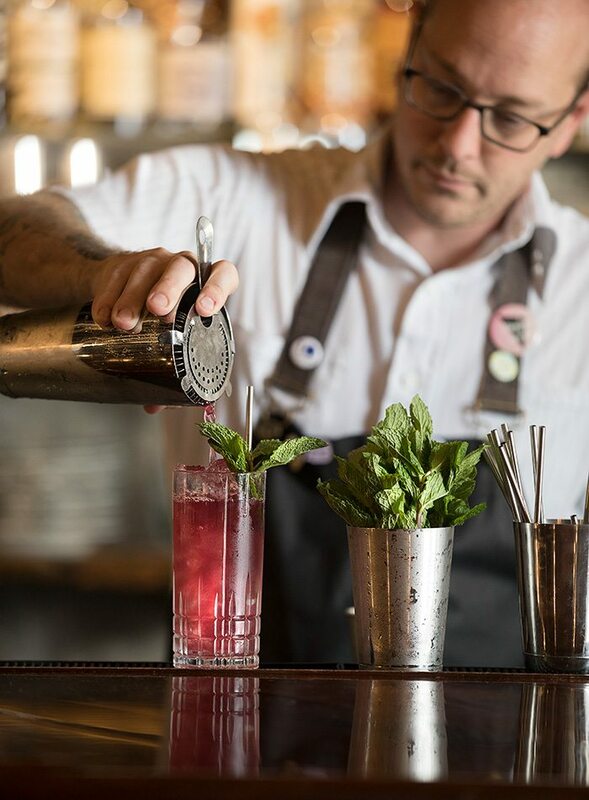 Custom cocktails, like the Oh-Mai-Jito, concocted by Doug Riddle plus a seasonally rotating menu await at Social on Patton. On one cold-like-winter-but-it’s-definitely-spring night, I met a few friends for dinner. We started out with drinks to get the blood and conversation flowing. 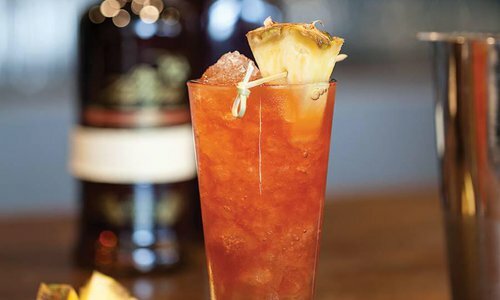 Each cocktail concept is concocted by Riddle and uses ingredients, pairings and flavors that are not only creative but also drinkable. To start, I ordered the Atlas Shrubbed with blood orange, which was bright, herbaceous and just potent enough to make me capable of persuading my fellow diners to order the bone marrow starter. A short time later, two big ol’ bones appeared on our table, delicately balanced on a board surrounded by grilled sourdough. The marrow had a brown sugar brulee that brought a touch of sweetness to an otherwise savory composition. My marrow-virgin friends weren’t so sure about the gelatinous texture, but they kept diving into the chive puree on the side. 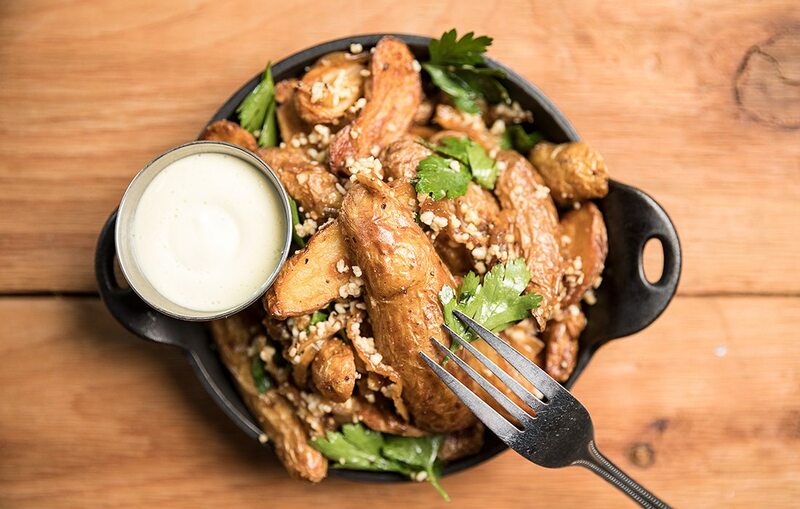 We also ordered spuds, lightly fried fingerling potatoes slathered in garlic, commingled with caramelized onions, sprinkled with parsley and served alongside aioli. Within minutes of the little skillet’s placement on our table we were fighting over the crispy chips and garlic remnants at the bottom. A second round of drinks—this time it was the Cocchi Fizz—helped us mull over the entrees. The offerings when we went in March included hearty dishes and preparations, like duck with cranberry chutney and beef cheek with roasted root veggies—heavy, warm-you-to-your-toes kind of food. When I returned in June, the menu was decidedly springier. As Riddle explained, the menu shifts with the seasons, but the scaffolding, as he calls it, remains the same. There will almost always be steak or salmon, but the preparation, sides and presentation vary. To fully embrace the winter mind-set in March, I ordered the beef cheek, which came bathed in beer gravy served atop garlic mashed potatoes. It had all of the warmth, fattiness and comfort of my grandmother’s best pot roast if my grandmother had been a professional chef and not so deeply in love with Campbell’s canned cream of mushroom soup. My friends ordered the salmon, which at the time was topped with maltaise sauce and served with rosemary mashed potatoes and herb salad. The summer version of the dish, pictured at left, comes with a toasted crumpet, herb spread, capers and pickled red onion and, the best part, is topped with a poached egg, bathing everything in sunny yolkiness. When you show up this month, expect something a little different. Seasonal availability and the general trends of the season—few want to tuck into a roasted duck when it’s 90 degrees—influence the menu, but Riddle and Stern also take diner feedback into consideration, and nowhere is that more readily available than at weekly research and development nights. Each Monday night, the team presents a limited menu of brand-new, weird, wild and experimental plates and cocktails, then diners rate them and leave feedback. Popular plates just might make it onto the menu in some form or another, democratizing the fine-dining experience. 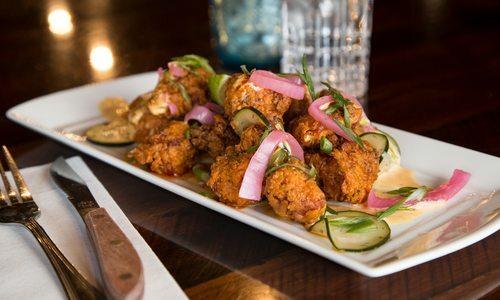 So, if you’re still bemoaning the loss of your fried chicken skins, head to an R&D night to air your grievances, but after a few dishes and a fully satisfied palate, you won’t think twice about missing those crispy skins. Every Monday night, head to the downstairs bar for R&D Night to try a limited menu of dishes and drinks the Social team is workshopping, then rate what you tried and leave your feedback. Your favorites just might make it to the main menu. For a fully customized meal, try the Chef’s Table experience, with a menu planned specifically for you and your group. 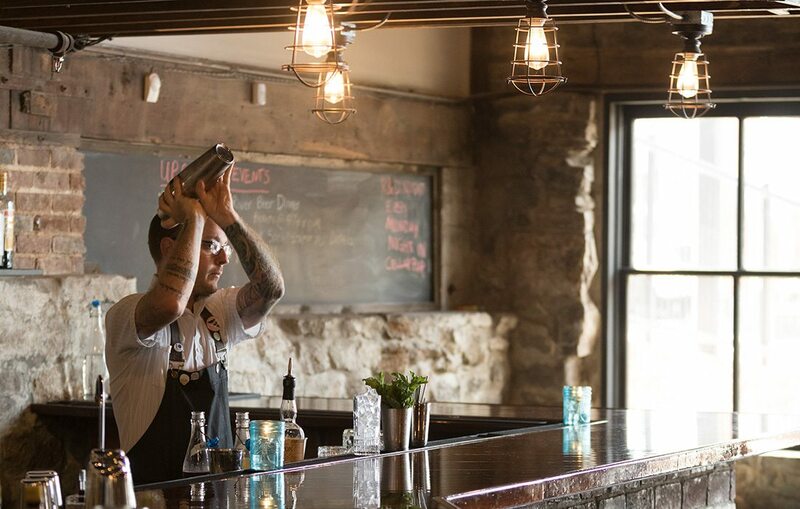 Also keep an eye out for special collaboration dinners with local breweries and restaurants. Expect the drink and dinner menus to change with the seasons as different foods become available and as new favorites emerge from R&D nights. This month, keep an eye out for the Invisible Gin cocktail, a favorite of Doug Riddle and Daniel Stern, plus some new dishes featuring summer-fresh tomatoes. 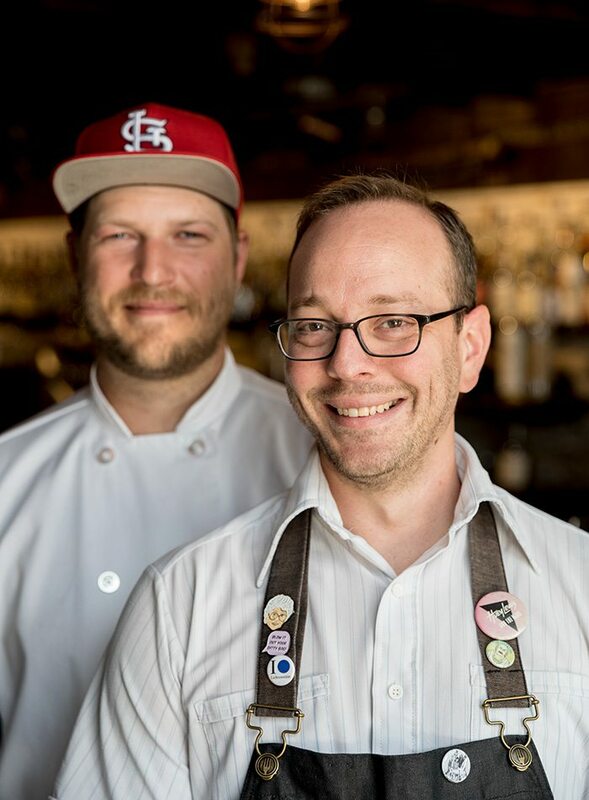 Executive Chef Daniel Stern and Beverage Impresario Doug Riddle. 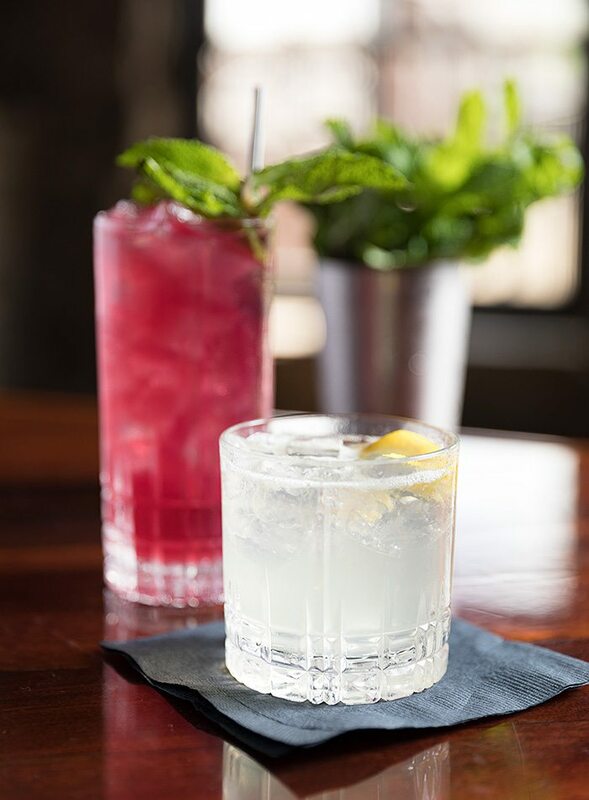 The Cocchi Fizz with gin, lemon, Cocchi Bianco and elder- flower liqueur (front). 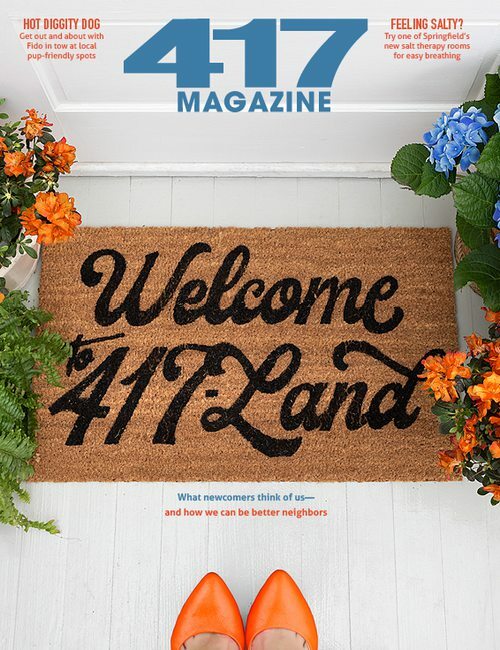 417 Magazine: How does Social on Patton differ from CB Social House? Daniel Stern: Social is a bit more chef-driven. It’s certainly more creative based, and it’s got a broader vision than just Southern food, like CB Social House did. We’re very focused on trying to elevate things that people are familiar with. Doug Riddle: We’re trying to delve a little bit deeper into stuff like wine, getting away from being so heavily focused on bourbon [and] moving toward more curated lists of things. 417: What informs your decision of what goes on the menu? D.S. : We tend to trust our instincts a little bit. We certainly test everything, and there are times when we’ve come up with things we absolutely despised after making it, so it’s a constant adjustment. Certainly access to product is another one that really dictates what we’re going to have on the menu—seasonality. Also, guest feedback. In R&D, we really lean into the feedback that we get from that night, and we really take that into consideration. D.R. : What we’ve learned a lot from CB is we’re not trying to put out dishes that alienate people. There’s a balance between creating things and making your customer happy. 417: What are your favorites? D.S. : Mine is the salmon by far. There are simple ingredients involved with it, but when they all come together, it really makes that dish complex. And I love eggs—the poached egg on top. You could put a poached egg on cereal and it’d be good. D.R. : I personally like the porchetta. It’s a dish I’ve had in my back pocket for a while. It was one of the most complicated dishes I attempted at home, [and] it’s something that I don’t see on menus a lot.